TORTOLA. December 2017 – O’Neal Webster congratulates Mitsy J. Ellis-Simpson on the recent publication of her book, Secret Code: British Virgin Islands and her successful campaign to raise funds which put 658 copies in the hands of students and school resource centers and libraries across the British Virgin Islands. Secret Code covers a wide variety of topics including BVI history, government structure, national insignias, law and order, education, financial services, tourism, health, and architecture, and also features stories of BVI pioneers and industry leaders. The author and sponsors of the book distribution project hope the book will promote learning and inspire BVI students. Distribution was originally planned for September but now takes on a particularly important role in December as the Territory enters the rebuilding phase after the recent hurricanes. 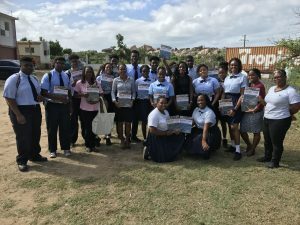 Among the schools that benefited from this generous donation are St. George’s Secondary School, Virgin Islands Technical Institute, Elmore Stoutt High School, Bregado Flax Educational Centre, and Jost Van Dyke Primary School. Three additional schools are set to receive copies later this month. Donation sponsors include O’Neal Webster, Scotiabank, Trident Trust Company (BVI) Limited, Carey Olsen, Martin Kenney & Co., Harneys, Medicure Ltd., Hunte & Co, Clarence Thomas Ltd, Nibbs Auto Parts, and the author. Mrs. Ellis-Simpson also donated $3,000 to the Ministry of Education & Culture to be used specifically for assistance with historical, cultural, or performing arts projects that will benefit the Territory in restoring, documenting, or advancing these areas. Secret Code: British Virgin Islands is available for purchase in local shops, including Serendipity Bookstore on Main Street and Olde Yarde Village in Spanish Town. The book can also be purchased online at www.secretcodebvi.com or Amazon.com.